We Specialise In Portable Bar Hire and Mobile Bar Equipment Rental. Our colourful mobile LED bars are ideal for all events from corporate events to wedding receptions. These stylish portable bar units have an illuminated front panel which feature. Static colour mode, rainbow effect lighting, fading light and light to sound reaction. 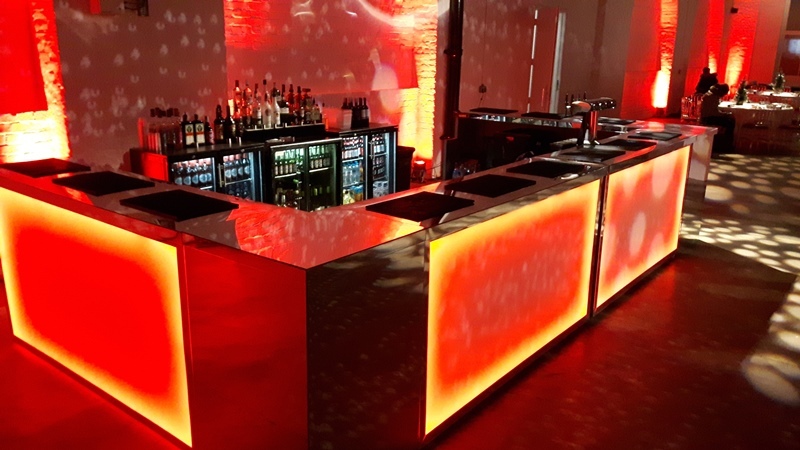 These bar units do add the wow factor to any event. Our contemporary LED mobile bar units are ideal for any occasion form private to parties to wedding receptions. These portable bars feature an illuminated front panel which do add the wow factor to any event. If you have a coloured theme for your event these bars can be coordinated to coincide with your theme. Our wooden mobile bars are ideal for any festival or large scale events. These units also work well for a rustic theme. These mobile bar units are suitable for any large outdoor event, and can be branded with your company logo if required. These are great for where large crowds are expected. These portable units are also suitable for a traditional themed event. London Mobile Bar Hire ,Wembley, Barnet, Wokingham, Event Bar Hertfordshire. Portable Bar Rental St Albans, Harpenden. Portable Bar Hire Hertford, Oxford, Maidenhead, Rent A Bar Borehamwood. Watford, Leighton Buzzard, Dunstable, Oxford. Portable Bar Hire Middlesex Temporary Bar Hire Bedfordshire, Cocktail Bar Hire Marlow, Hire a Mobile Bar Birmingham. Outside Event Bars Oxford Pop Up Bar London, Birmingham. Cocktail Bar Hire London. Pop Up Bar Birmingham Pop Up Bar High Wycombe Theydon Bois. Mobile Cocktail Bar Hire, Wedding Bar Oxford, Party Bar Hire Central London, Outside Bar Hire Essex. Bar Equipment Hire Buckinghamshire. Pop Up Bar Ruislip , Pop Up Bar Hire Ruislip , Dry Bar Hire Birmingham, Portable Bar Hire Birmingham, Mobile Bar Hire Coventry.